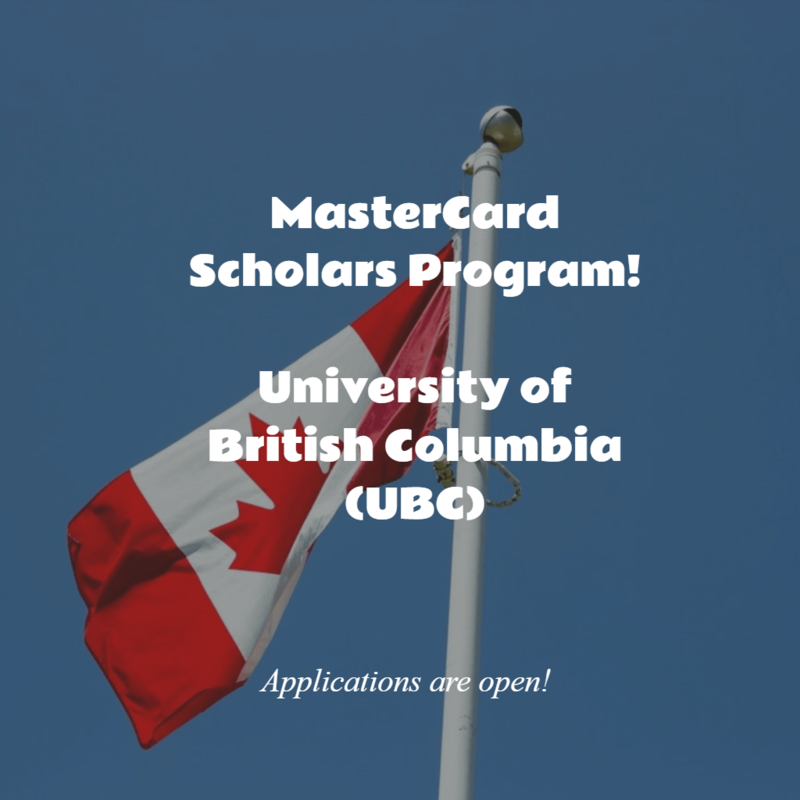 The University of British Columbia (UBC) has co-operated with the MasterCard Foundation to foster the next generation of African leaders. These scholarships target individuals from Sub-Saharan Africa who are academically talented but face economic disadvantages that prevent them from getting access to relevant and high-quality university education. After graduation, the MCF scholars use their experience and learning to contribute to economic growth and social development in their home countries. Recipients of this scholarship will get to benefit from the exceptional learning environment at UBC, one that fosters global citizenship, supports outstanding research and advances a sustainable society. Economics, business, forestry, computer science, sustainability and environmental science, and engineering. 112 students will receive funding from the MasterCard Foundation over a ten-year period (77 undergraduate and 35 masters degree scholarships). For both the undergraduate and graduate programs, one must be a first-time applicant who is resident in, and a citizen of a Sub-Saharan African country. The applicant’s permanent residence must be in Sub-Saharan Africa. Show commitment to returning to Africa after graduating and giving back to his/her community, thus enhancing social transformation and economic development. Present economically disadvantaged circumstances that stand in the way of pursuing graduate education in one’s home country or elsewhere. One should be able to show a lack of financial means from family and other sources. Demonstrate an interest in giving back to one’s community with the aim of enhancing economic growth development. One must also be committed to engaging in activities through one’s current profession, community or university that will benefit their home countries. Be committed to returning to Africa immediately after graduating, so that they can apply their new skills and training for the benefit of their community. Undergraduate students must be nominated for the scholarship by a high school or non-profit organization. Each nominee must also complete an online application for academic admission at UBC and an undergraduate MCFSP application. Graduate students from Sub-Saharan Africa who qualify for the scholarship need to fill in an application package for admission into one of the faculties listed above. More information on how to apply for the MCFSP is available on the UBC website. Graduate applicants who did their bachelor’s degree in a language other than English must make arrangements to take an English Proficiency Exam (IELTS or TOEFL) and have the results sent directly to UBC. Graduate applicants should apply to MCFSP before applying to UBC. All MCFSP applications should be received by Nov 17, 2017. This date applies to both undergraduate nominations and graduate applications.